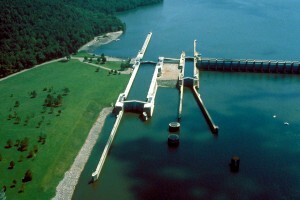 Alabama’s largest http://www.strolf.com/, Lake Guntersville, is known abundance of aquatic vegetation. In addition the lake is full of submerged stump fields, channel ledges, flats, and feeder creeks. Lake Guntersville is a premier angling destination for professionals and amateurs alike. Lake Guntersville is approximately 69,000 acres in size. From Nickajack Dam to Guntersville Dam, the lake measures 76 miles. The deeper portions of the lake generally consist of sand, gravel, and mud. the steep ledges of old stream channels consist of limestone. Most of the shoreline has a sand and gravel bottom. Guntersville Lake has very fertile water with frequent algae blooms. The lake has significant grass coverage throughout its length. Hydrilla and milfoil are also abundant. Deep weedlines are found from 10 to 18 feet. Prior to impoundment, all trees were removed but large fields of stumps remain, particularly in Browns Creek, Roseberry Creek, Mud Creek, North Sauty Creek, and South Sauty Creek. There are also several rip rapped causeways. © 2019 Lake Guntersville Fishing Guide Service. All Rights Reserved.